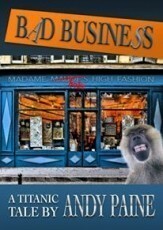 When the hapless (and chap-less) Bob Bobbins inherits his fake dead grandmother’s estate, he is handed the keys to a rather exclusive business, ‘Madame Bob’s High Fashion.’ Unfortunately, that business happens to be based in the treacherous world of high fashion, a world where murder is considered a far less distasteful act than poor taste. Can Bob, with the help of his inherited staff, avoid the murderous overtures of the Fashion Assassin, defeat the pluming peacocks that are the Fashion Union (F.U), avoid the relentless sleuthing of Detective Dan, and find the courage to save the day, and win the girl (who may or may not wish to be won)? Bad Business is an irreverent fantasy, kind of, which pokes fun (not physically) at government administration, the legal system, unions, fashion, consultants, and others. Set in the mischievous city of Titan, Bob must overcome vampire prosecutors, cross-dressing judges, leprechaun refund officers, trendy dwarves, street corner consultants, a democratically elected despot, a grapevine that will not shut up, and a rather large elephant in his room.